Yorkpark announces the arrival into Australia of Rex USA Ch Terrorific The King's Legend. 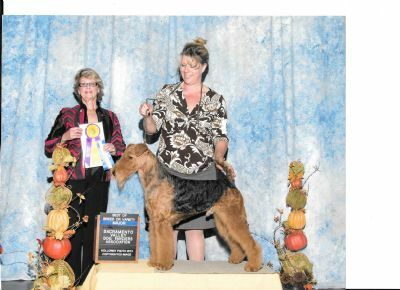 Thank you to our wonderful USA friends Virginia Latham-Smith, Deirdre Hernandez, Robert & Susan Lucas for allowing this outstanding Airedale to come to Australia. Rex has a superb temperament, great physical body and a quality Black & tan coat. Rex is available at stud by negotiation. Watch for Rex in the ring from Autumn 2015.